CHEOPS at the Center for Space and Habitability (CSH) of the University of Berne. Space experts will put the completely assembled flight instrument in the chamber and calibrate it therein under space conditions. At five and a half tones, the calibration and vacuum chamber for the space telescope CHEOPS (CHaracterizing ExOPlanet Satellite) is heavier than a fully-loaded light truck. A person could comfortably sit in the three metre-long and two-metre high cylinder. Considering its size and complexity, this test chamber in the new CHEOPS laboratory of the Center for Space and Habitability (CSH) of the University of Berne is unique in Switzerland. It will serve to calibrate and qualify the small telescope with the great ambitions under space conditions. 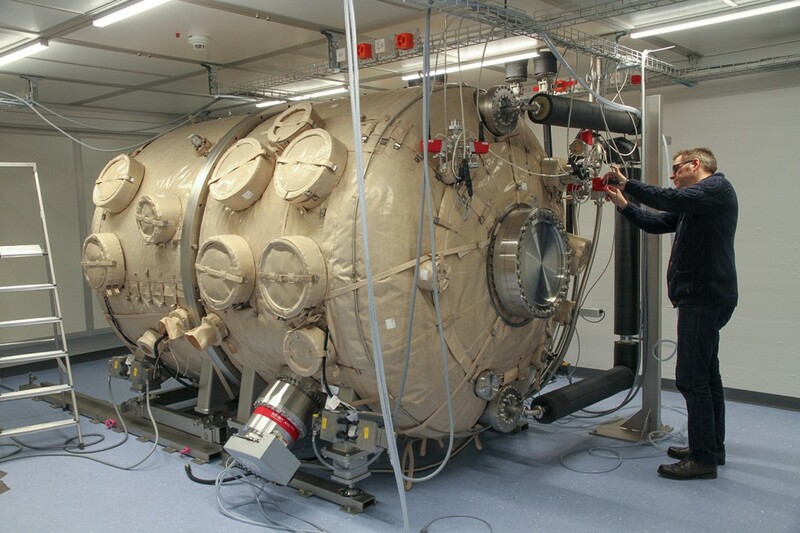 Already since weeks, the Bernese space researchers have been looking forward to the delivery of the huge vacuum chamber which was ordered from Pfeiffer Vacuum Switzerland. But in spite of the increasing time pressure, they waited patiently and gave the vacuum chamber enough time to outgas thoroughly: experts at Trinos in Göttingen (G) already assembled the chamber and started the outgassing process several weeks ago. Since then, they have been heating the chamber to 160 degrees Centigrade. With regard to the planned optical tests, it had to be made sure, that the internal painting would not release any chemical compounds once the baking was over. Once the outgassing was complete, the experts dismantled the chamber again in two halves. These delivered to Berne by road train together with a thermal control system that is as big as a wardrobe, and additional accessories. After the truck reached the CSH, it still took more than four hours for the technical experts from Göttingen and members of the Bernese CHEOPS-team to guide the two several tones heavy and bulky halves of the chamber through the narrow and winding corridors. The team’s biggest worry was the service elevator – would the chamber halves really fit inside? “When the first half finally stood in front of the CHEOPS-lab, a weight was lifted off my mind”, comments CHEOPS project manager Christopher Broeg on completing the challenging journey through the building. On the next day, the team went about the positioning and assembly of the vacuum chamber and the additional accessories in the CHEOPS-laboratory. The experts improved all seals using copper, Helicoflex and rubber. Now, they have to test the rate of leakage and to connect the vacuum chamber with all pipes and pump systems as well as the two thermal control units. After everything is set up, the experts will perform a function test with the complete system. The first thermal system circulates liquid and heats or cools it to a set temperature, which reaches from minus 80 up to 160 degrees Celsius. Then, a heat exchanger transfers the temperature of this liquid to a second thermal system. The second liquid flows through a pipe system which covers the whole inner surface of the chamber. All liquids are under a pressure of up to 12 bars to prevent them from boiling at temperatures between 90 and 160 degrees. Subsequently, the installation will be heated up to 160 degrees again for several weeks to allow for complete outgassing. Afterwards, a specialised cleaning company will modify the complete CHEOPS-laboratory with the vacuum chamber in it to clean room standards. From now on, only CHEOPS team members with special protective clothing, gloves and masks will be allowed to enter the new cleanroom “CHEOPS laboratory”. Not later than this summer, experts of the Bernese CHEOPS team will run thermal cycles on structure and electronic compounds of the CHEOPS telescope: under vacuum they will subject the material to temperatures from minus 80 to 140 degrees. This “ungentle” treatment is part of the standard qualification tests for space instruments. The assembled structure model of CHEOPS will undergo similar tests in late summer 2015 and in the beginning of 2016, it will be the turn of the completely assembled flight instrument. For more pictures go to CHEOPS Website. In neighbouring solar systems, countless planets circle their stars. In less than three years, the Swiss space telescope CHEOPS (CHaracterizing ExOPlanet Satellite) will start to explore the properties of these so-called exoplanets. A short time ago, scientists were limited to the characterisation of planets in our own solar system. But now, they can go about studying exoplanets as well. To do so, CHEOPS will use the transit method and measure with great precision the diameter of selected exoplanets that pass in front of their home stars. When a planet passes in front of its star, the brightness will be dimmed because of the shadow of the planet. From the decrease in brightness, the diameter of the planet can be derived. With another method, called radial velocity method and provided by earth based instruments, the mass of the planet can be determined. Both methods can be used together for selected exoplanets to determine their density and other properties. It is a way to find out whether the planet is made of stone, ice, or gas. Thus, CHEOPS may bring us closer to the distant goal of discovering a planet that has characteristics similar to the Earth and might be capable of sustaining life.